Our Club proudly serves the communities which are touched by the tidal waters of the Chesapeake Bay in the Norfolk-Virginia Beach areas. These stretch from the waters of the James River south of Williamsburg, east to the Northern Neck, south into Newport News and Hampton. Then, across the Chesapeake Bay into Norfolk and Virginia Beach, Portsmouth to the west, and Chesapeake and Suffolk which are due south. Our members come from diverse backgrounds, united in a common interest and passion: The Love of the Afghan Hound. For that purpose, we come together for monthly club meetings which combine business and educational programs with a healthy dose of socializing. Our meeting place allows animal-visitors, so frequently, an Afghan Hound may be among the attendees. Our membership makes a commitment to the local community. We sponsor local canine health clinics, invite the general public to our educational programs, we have an active rescue ‘arm’, we donate to local charities and are involved with veterinary open house programs for children. 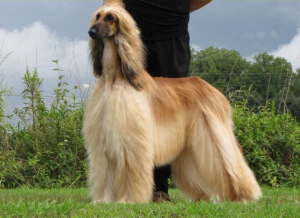 On a National level, the Tidewater Club has sponsored an Afghan Hound Club of America National Specialty Show and three AHCA Breeders’ Cups. We are extremely proud to host and assist in a DNA Collection for Canine Cancer Research during our 2010 show weekend and consider this an important contribution to the greater purebred community. Our Club holds Specialty Shows each year in March. Since 2009, our show ‘home’ has been at the beautiful Wyndham Hotel Oceanfront in Virginia Beach. We can proudly say that our Specialty Weekend is amongst the largest in the country. We try to provide the best of the best for our members. We attempt to offer the same to the Afghan Hound Fanciers who come to our shows. Since its inception in the mid-1970’s, the goal of the Tidewater Club has been to be a ‘Flagship Club’ providing for the needs of members, community and breed. We believe that we have. Visit us on our website. Better yet, come see us in person. We love the Afghan Hound and welcome others who feel the same way.